“Compost, 3. A mixture of various ingredients for fertilizing or enriching land.” (This definition first recorded in print in 1258 A.D.)—The Compact Edition of the Oxford English Dictionary. It wasn’t long after agriculture was invented, I’m sure, that someone began talking about composting. Maybe it even predated agriculture, and someone simply noticed the plants growing next to refuse piles were larger than the rest. Today, composting methods can vary, but they ultimately accomplish the same thing: provide a nutrient dense soil for your plants. There are the free-form methods of composting where, like jazz, we are inspired to experiment with what’s available. Whatever goes into the piles, eventually decays. Then there are the methods requiring careful construction, like classical music: a particular size and construction of bin, proper proportions of green and brown materials, and a certain amount of moisture and manipulation to maximize the speed of decomposition. And of course, rather than make their own music, many folks opt for the radio, sending yard waste to the city’s compost facility. And, hopefully, everyone is also picking up finished compost to use in their gardens. –Compost provides nutrients, same as chemical fertilizers, plus more micronutrients. –Compost has microorganisms that help plants absorb nutrients. –Compost releases nutrients slowly so that plant growth is healthier. 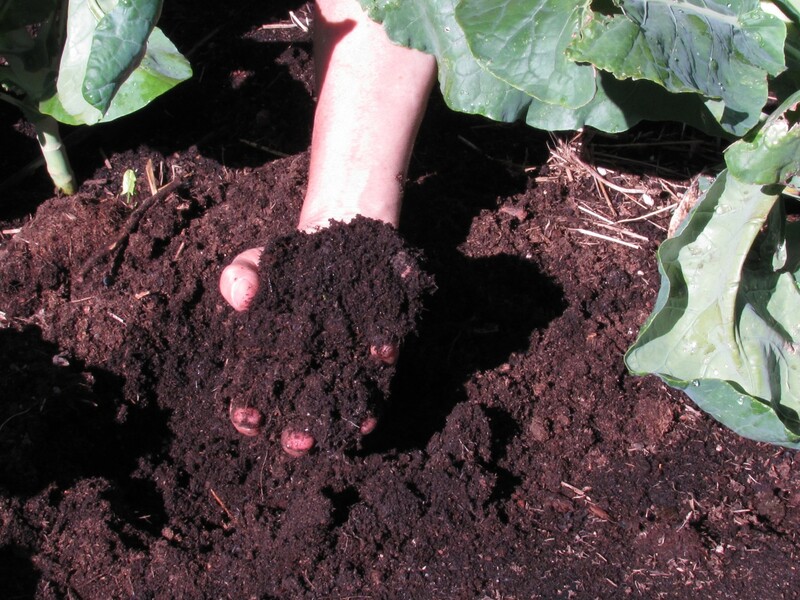 –Compost helps the soil hold water. At the most primitive level, composting can be accomplished with tools you already have for yard and garden maintenance, and with not much more effort than disposing of yard waste. Over time, Mother Nature rots nearly every once-living thing. Still, there are a few principles to keep in mind for best results. Several sources say the optimal size of a pile is a cubic yard, 3 x 3 x 3 feet. Using some kind of container–a bin, trash can or fencing–holds it together. Composting requires the right amount of moisture. With our dry climate, you may need to add water sometimes. Composting requires oxygen, or you may begin to get the odor of anaerobic decomposition. Holes in the side of the bin or wire mesh sides help. So does turning the pile, so that the stuff in the center trades places with the outer part. Introducing good microbes speeds the process and is as easy as adding a little dirt—even soil clinging to weed roots may be enough. Mixing green stuff, like grass clippings, with brown stuff, like dried leaves, with the addition of regular turning, can make the compost “cook” hot, possibly hot enough to kill weed seeds and diseases. But like me and my husband, most folks I talked to don’t manage their compost at that level–not enough to reach that sanitizing heat level. –No seeds of weeds. Add weeds to compost before they go to seed. –No woody stuff unless it is chipped into small pieces. If it doesn’t decompose in one batch, sift it out and add it to the next, or put it under your shrubs and trees as mulch. –Nothing that has been treated with herbicides within two months. Same goes for pesticides, especially if it is intended for the vegetable garden. Manure is a more complicated subject. It has to be from a grazing animal—not from cats, dogs or people. It could be full of seeds. It could be full of salts, which our soils do not need. It could be full of medications. It could be too hot—too strong—and burn your plants if it hasn’t aged enough. Composting kitchen waste is something I’ve never been able to get my family interested in. But what I’ve learned is you want to stick to plant materials. No meat, no dairy, no grease, no oils, no salt, no processed food with unpronounceable ingredients. Maybe eggshells. To be safe, just stick to fruits and vegetables—including coffee grounds. And no wood ash. Gardening books written by easterners forget that places like Cheyenne already have alkaline soils and wood ash will make it worse. Years ago, Mark and I bought a system that is essentially a sheet of heavy green plastic with several stakes that fit into any of multiple slots in the sides to form it into a barrel shape 3 feet high and 8 feet around (2.5-foot diameter). We throw stuff in and when we need some compost, perhaps months later in the spring, we dig out the stuff at the bottom. We have four large trees that shed plenty of crispy curled brown leaves in the fall. Some of those we layer in the vegetable garden after frost to decompose. Some I use in the perennial flower bed for winter insulation—thinning them out in the spring if necessary. The rest we bag up to keep them from blowing away, saving them for spring. Then, we dig more of them into the vegetable garden, use them as mulch or add them to the bin between layers of lawn clippings—though clippings are often used as mulch as well. I recently visited Laramie County master gardener Maggie McKenzie to see what she is experimenting with these days. Her husband, Don, built a nice three-bin system, much like the one you can see next to the green shed at the Cheyenne Botanic Gardens. One bin is for collecting, one for cooking and one is available for spreading. Hugelkultur, a European gardening method in which compostable materials are layered over logs and wood debris, is catching on in the U.S. Maggie McKenzie established this bed last year and her husband, Don, decided to add the retaining wall. Photo by Barb Gorges. 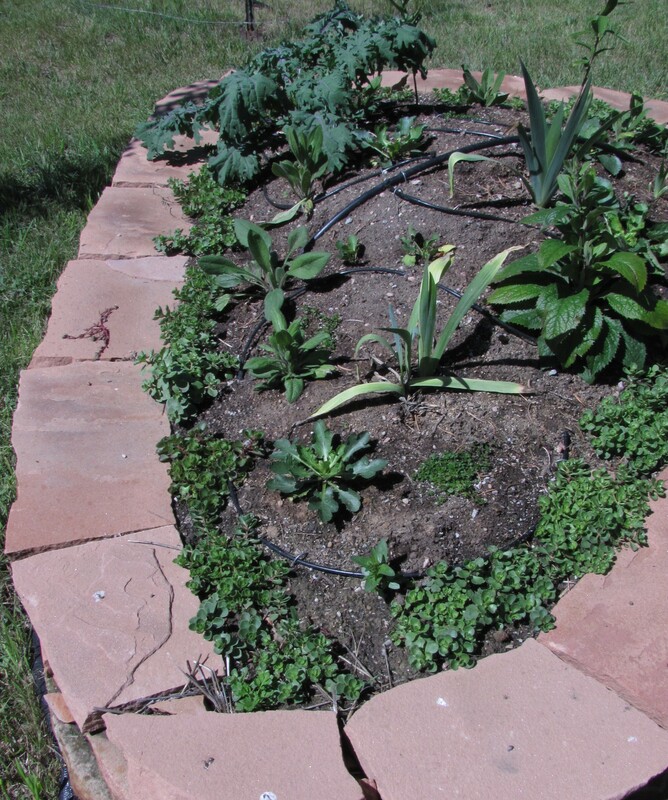 She is also having success with “lasagna gardening.” To start a new garden bed, lay down a thick layer of wet newspapers (The Wyoming Tribune Eagle is printed with soy-based ink and is safe to use) or wet cardboard. Top that with a 2-to-3 inch layer of peat, then a 4-to-8-inch layer of yard waste, then more peat, then more yard waste, until you have built up 18 to24 inches. As it ages, it will shrink. Letting it overwinter is best. Maggie’s lasagna is for vegetables and is set up inside a raised bed frame, which keeps the wind from taking it apart. For annual upkeep, just add more layers. It is supposed to be ideal for starting and maintaining any kind of garden. Maggie is also trying a variation of lasagna gardening that includes logs and other woody debris. Known as a hugelkultur bed, the woody layer is placed on top of the wet newspaper or cardboard. 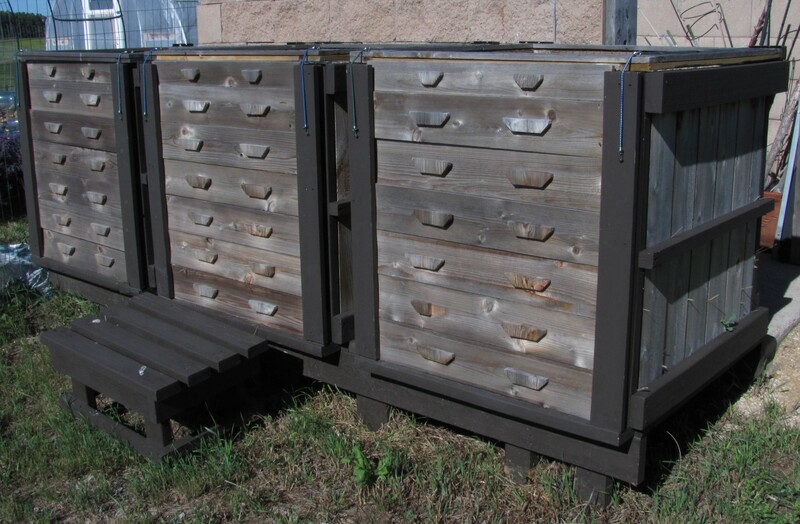 The decomposing wood provides a steady supply of nutrients and holds moisture. Don finished the mounds nicely with retaining walls of sandstone. “Organic Gardener’s Companion, Growing Vegetables in the West,” by Jane Schellenberger, editor of the “Colorado Gardener,” www.ColoradoGardener.com. “The Colorado Gardener’s Companion,” by Jodi Torpey of Denver. “Lasagna Gardening,” by Patricia Lanza. Categories: Compost, Garden maintenance, Gardening, Mulch | Tags: Cheyenne Botanic Gardens, compost, compost bin, composting, composting manure, fertilizer, fertilizing, garden, gardening, hugelkultur, Jane Schellenberger, Jodi Torpey, lasagna gardening, mulch, Patricia Lanza, University of Wyoming Extension | Permalink.